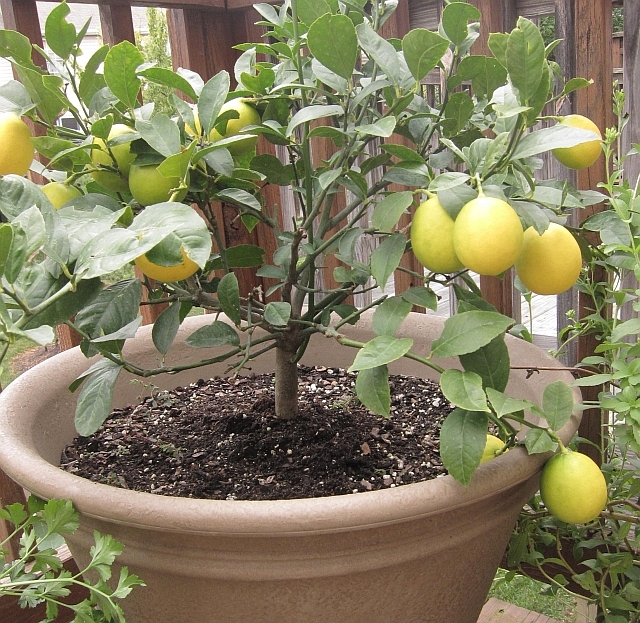 The weather is getting cooler so I will need to bring my Semi-Dwarf Meyer Lemon tree into the house soon. Its lemons have finally turned completely yellow after being green and the same size for over 3 months. Sometimes I wondered if the tree was actually a lime tree. But my husband knew it was a lemon tree. He gave it to me this year for Mother’s Day. This past weekend, I picked 5 lemons from the tree. I squeezed one lemon. Its juice was sweeter and its peel was thinner and more tender than store bought lemons. I mixed the juice from one lemon with hot water and a few drops of Stevia to make a soothing vitamin C rich drink for my husband who was sick with a cold. I discovered that lemon zest can be frozen and lemon peels can be made into candy! I plan to try this recipe for candied lemon peel. I will let you know if it tastes as good as it looks. The lemons took awhile to ripen, but they are ready at just the right time for cold and flu season and holiday baking and candy making! Its amazing how they ripened right at the time they were needed the most! That’s great Jonna and Dan. How handy? Do you expect it to do ok inside? I’d love to get one of these myself. My aunt has one and hers does well indoors over the winter. The blossoms are very fragrant. You will enjoy it!